Hands, Heads, and Hearts Required! 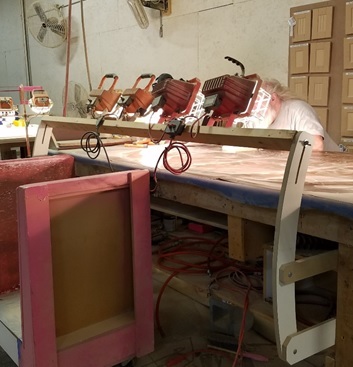 At Brushy Creek Custom Doors, we continue to seek opportunities to improve our team dynamic and our production process. As 2019 begins, we are excited to look back and see the progress we have made since we began our “Lean Journey” in March of 2017. We have discovered that, at its heart, LEAN is about getting "continuous improvement" in processes by investing in "continuous improvement" of our people. 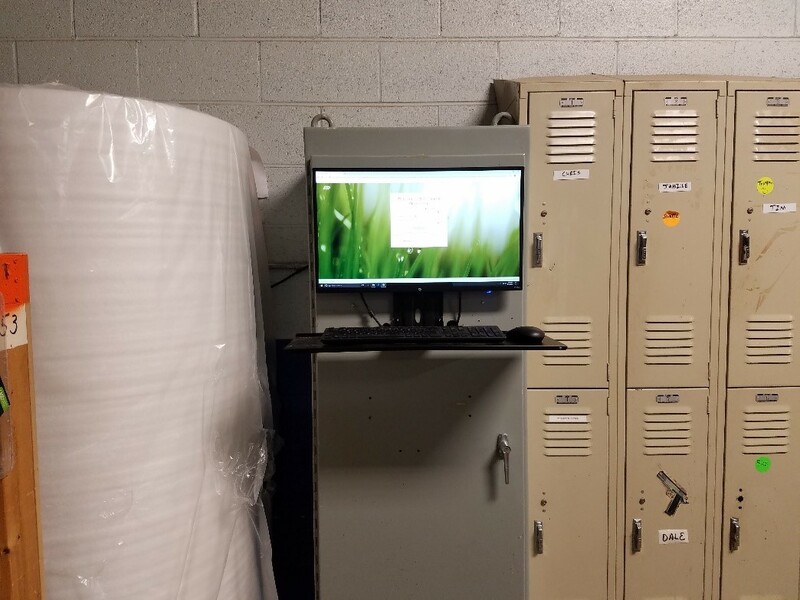 We have learned a lot about the nature of waste, reducing waste, and about making one improvement a day so that our process will be “easier, better, faster, and cheaper.” (And yes, the order DOES make a difference!) The idea of giving our team members something that benefits them both on and off the job fits perfectly with our core value of "Caring." And as we help each other to get better, we improve the “Service Attitude” we bring to each other, and to the customers who depend on us to help make them successful, too! The Handwork/Quality Control Department is required to use larger backers to support smaller parts that will not fit on the pegs in the spray booth. The Press Team noticed parts were beginning to stick to the backers, therefore causing an increase in overproduction and defective output. We needed a way to eliminate this problem and to improve our efficiency and throughput. 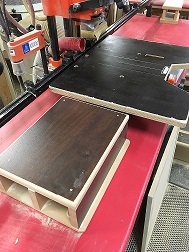 Our Handwork/Quality Control Team then came up with an idea to elevate the parts so that the melamine isn't touching the backers. We repurposed old membranes by cutting them into strips and gluing these to the backers. Now, when the parts lay on the backers they are elevated causing a significant decrease in overproccessing and defective output. Written by Toney Walker on March 28, 2019. 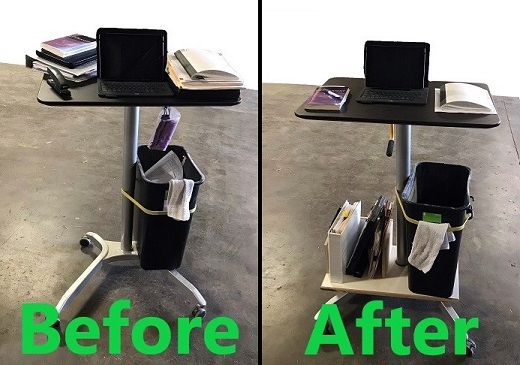 Initially my work station consisted of any unused flat surface that we had in our shop; then we purchased a very convenient roll-a-round desk that gave me a great deal of mobility and regularity to my work station. This desk did not provide much in terms of storage for any of the folders, binders, or paperwork that I would regularly need in my day to day task; resulting in me having stacks of work piled on top. So what was the problem? Well, I was constantly over processing my work, by stacking and unstacking as I needed materials, when I needed to move my station from one department to another those stacks would occasionally find their way to the floor.... this would inevitably result in defective output and again more over processing when I had to take and restack everything. All of those waste then resulted in waiting for my team, as they had to wait for me to get to them or, and more often the case, for me to get out of their way! So I put myself to task and built a small sectional platform that fit around the base of my desk to house all of my paperwork. Now I can keep only what I need right now on the top workspace! Additionally I managed to find another area of improvement by adding an extension cord and a hook to hand said extension cord, which gave me even more flexibility in where I work! Written by Chris Gillespie on March 21, 2019. This month during our Morning Meeting Learning Time we focused primarily on learning the various aspects of the Waste of Overproduction. Overproduction is the worst of the eight different wastes because it causes many of the other wastes and it also obscures the need for improvement. It is defined as making products in too great a quantity before they are actually needed. This usually leads to excessive inventory, whether it's work in process or finished goods. 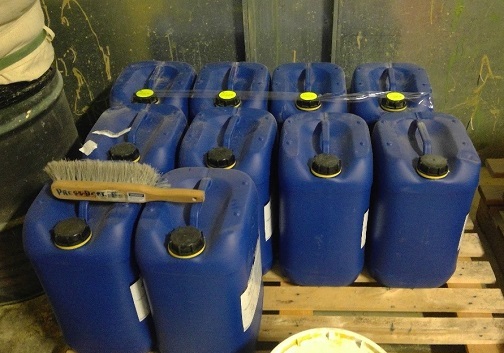 One symptom of Overproduction is seeing large batch sizes being processed and we definitely have seen this on a regular basis, as door orders move through our plant. 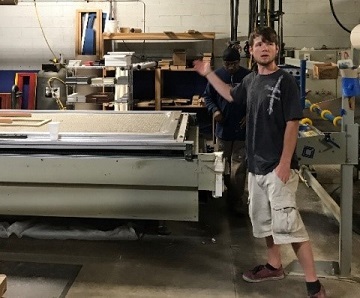 This month, the Routing Team began implementing a maximum amount of orders/parts that are placed on each cart after they are routed. 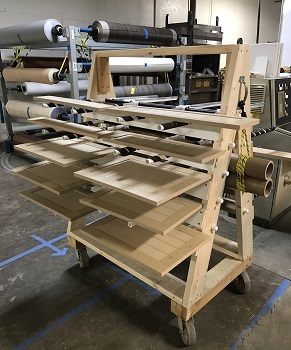 Making our batch size smaller on each cart has definitely improved the overall flow of orders, as well as making it much easier to keep our flow in the correct order. Pretty awesome results! Check out more information on the Waste of Overproduction by clicking here. Written by Mark Sullivan on February 28, 2019. During the month of January the Press Team made a really cool and "elevating" improvement by building a platform directly in front of our press. This helps the press operator who is laying out doors onto the almost 5 foot wide press table, be able to reach fully across it much more easily. This definitely makes their job through the day easier - very innovative! 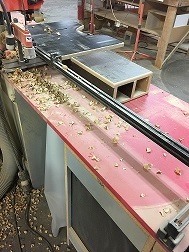 We use long 1/4" thick pieces of MDF as platforms to place our Moldings onto while they are being sprayed with glue. The Handwork/Quality Control Department came up with an amazing idea to store these onto the wall right next to the racks where they'll be used. 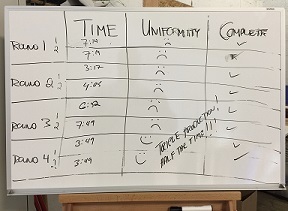 Part flow from our Press to our Quality Control check point was greatly improved by reducing the amount of space between the two areas and striving for the one-piece part processing that the Lean community emphasizes. It really does make the process EASIER and BETTER! Written by Mark Sullivan on December 30, 2018. A new clock-in station was added to the shipping department. With fewer people clocking in at each station, the work flow is improved. This allows people to clock-in faster, which saves them time with a necessary process each day. It also saves travel time now that there is a clock closer to their process in shipping. Written by Julie Arnold on October 4, 2018. The vacuum pumps at each CNC Router were relocated outside onto a concrete slab and covered with an overhang. This helps keep the entire Router Department much cooler. 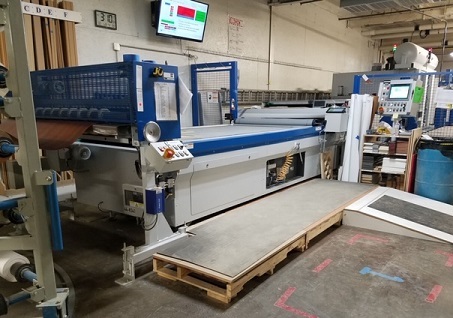 Space is limited on the production floor, so we want to have only essential tools and machines inside that space. 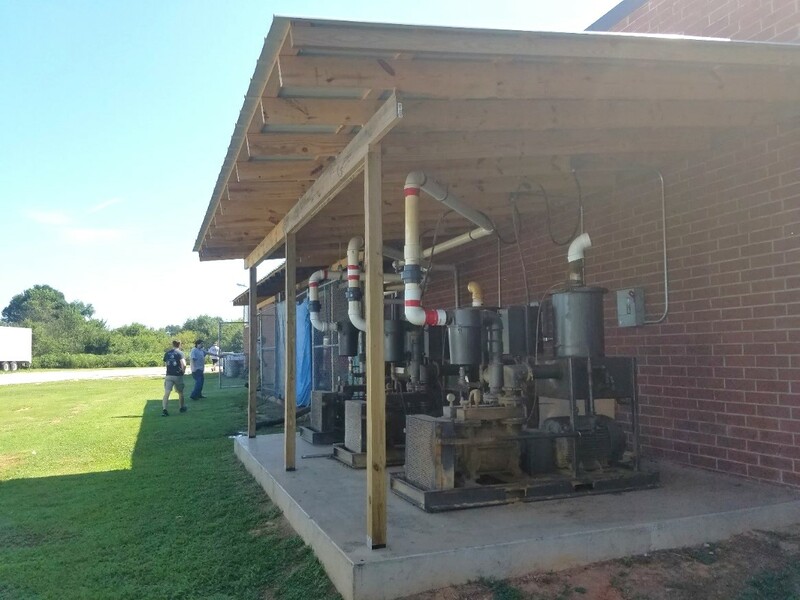 Because the vacuum pumps were relocated outside, it not only allows for more space availability inside, but it also allows the Router Department to be subjected to less heat and noise from these machines. The QC/Handwork Department converted a regular parts racks into a Hot parts rack. By creating a special rack for parts that are rush orders and/or re-work pieces, it allows the team to see immediately what parts need to be processed. This limits confusion and allows the rush orders to be processed ASAP. Before, they were mixed with normal orders, which potentially added time to an otherwise quick process. 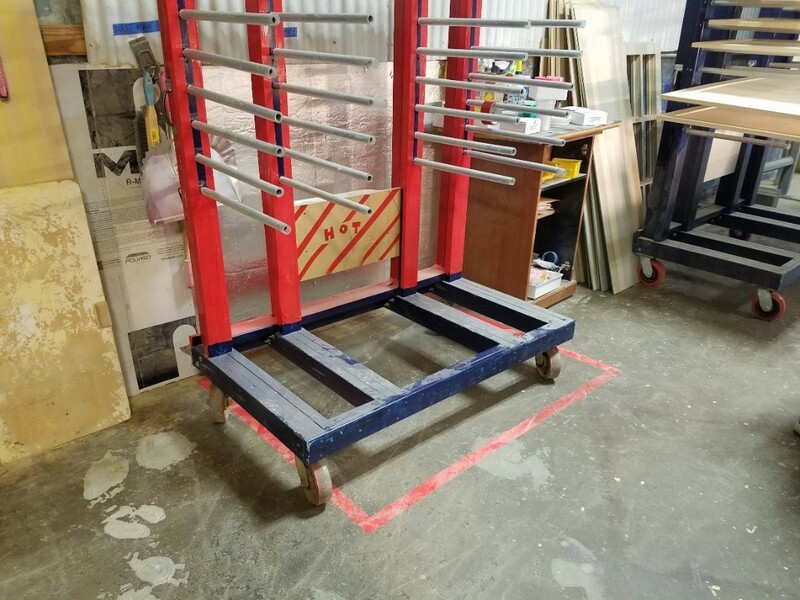 A new staging rack was created for our Shipping Department to store 4 Foot Pallets to make more room for 8 Foot Pallets. This saves space, allowing for more to be stored in the same amount of floor space, which is an expensive commodity. Written by Julie Arnold on July 26, 2018. 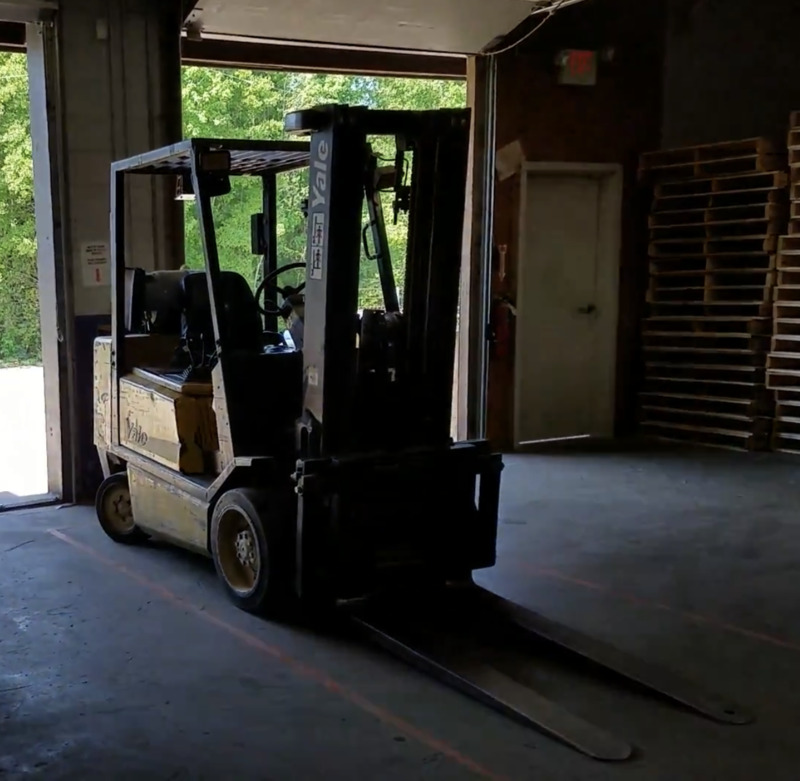 A new parking space was created for our forklift to keep it out of the way. The old area had the forklift parked either in front of boxes or pallets. This required the forklift to be moved every time something behind it needed to be accessed. Moving the parking space to its current location keeps it out of the way, and allows for easy access to the boxes and pallets. 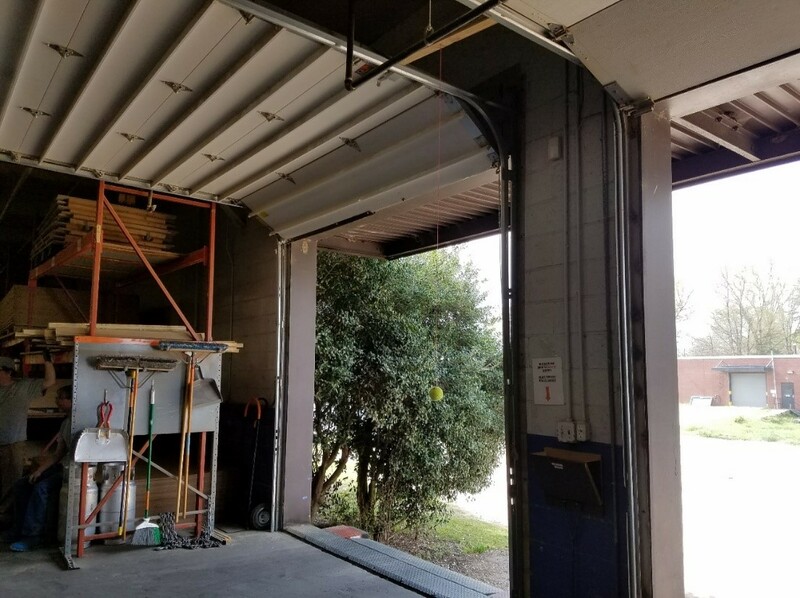 Also, a hanging tennis ball was placed in directly behind this new parking space to be used as a reference point to assist in parking the forklift without hitting the outer wall of the Shipping Department. This aids in time, motion, over processing, and safety. Our new and improved bailer is more efficient than the previous one. 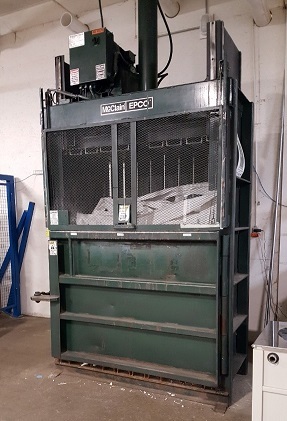 The increase in capacity allows for more trash to be put in at a time, reducing the amount of times the machine has to be used, which should increase the life of the bailer as opposed to the older model. Bailing the trash saves space on the floor and removes waste from the production areas. David McGarity lead a team to 5S our three restrooms. 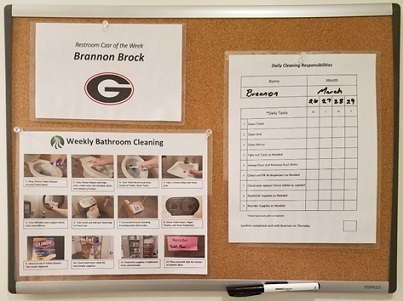 To help standardize the daily cleaning, the team came up with an improved Bathroom Cleaning SOP. They created a board with a laminated SOP, a laminated check off sheet, and laminated Bathroom Czar of the Week cards. They even added a fun personal image under each person’s name. Having a standard for cleaning the bathroom takes the guess work out of the process, which reduces the time involved, and ensures that the each bathroom is cleaned thoroughly. It also saves time in explaining the process to a new team member, allowing them to see the process immediately. 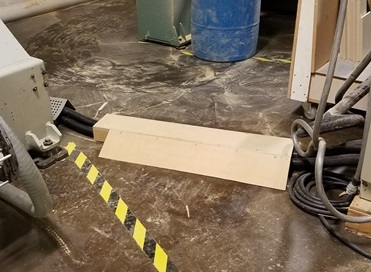 The The Routing Department got together with Russ to design a wire cover so that team members could safely cross over electrical wiring by the CNC Routers. Trip hazards are always an issue in a manufacturing environment. Any improvement that covers items on the ground, or that removes them entirely, helps protect the health and wellbeing of our team. Written by Julie Arnold on April 12, 2018. One issue we’ve faced for awhile now is the lights on stands in our handwork area. They were a tripping hazard and easy to bump into. Also, to turn them off and on every day, each lamp had to be turned on individually. Russ worked with our Handwork Department to design a special light stand that is assembled to the table. It’s fully adjustable and holds all the lights on one long bar. Not only does it remove the stands from the floor, but Russ ran the electrical around the table into a switch so that the lights could be easily turned off/on. This improvement saves on much wasted space, motion, distance, and time. Another major improvement during this month was a reorganization of our Handwork area. The entire department came together and designed a new flow chart for “work-in-progress” inventory carts. They mapped out the area on the floor with special colored tape, and created signs and charts to be seen above the path, directing others on where to place the next cart. This has reduced confusion, extra walking time, space, motion, and distance. The Routing Department stores the offcuts from partial sheets of MDF standing upright in between rails as shown. 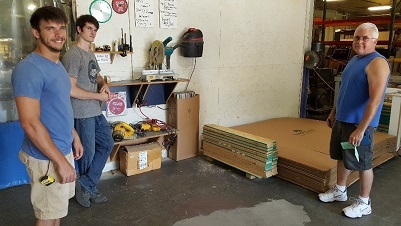 As the boards are removed and replaced, they can get damaged from the rails, which means purchasing new boards more frequently than necessary. With the addition of carpeting on all the surfaces that touch the boards, damage is reduced, which reduces waste and cost. Written by Julie Arnold on January 30, 2018. During the month of November, Geoff and Russ helped the Handwork Department build new racks to hold doors, along with place holders for the vinyl for those doors. The vinyl holders prevent trash and debris from collecting on the vinyl, which would in turn end up on the finished product. 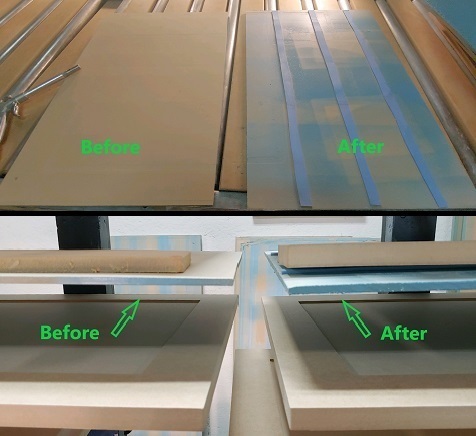 This reduces defects, and saves cost in rework time, as well as vinyls. In any manufacturing environment, there is always a risk of overproduction, and defective production. Having SOPs posted at the site of production helps limit possible errors when it comes to job completion. Also, new hires always know where to find the correct steps for each process, which allows them to do their job with confidence. Because the Handwork Department is human operated, it’s possible for human error to occur. If the SOP is followed to the letter, it eliminates the possibility of defective products, which in turn saves time and money, and effort. 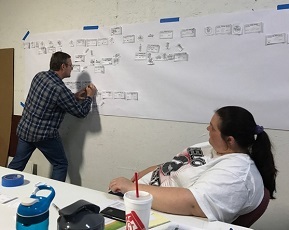 One of our Founders, David McGarity, as part of the Lean Improvements, looks for ways to improve the re-order process for inventory. One of many changes made recently is to put Re-order labels on the last products on the shelf so that when they get used the labels are then placed on David’s desk for re-order. This has helped eliminate downtime due to running out of stock. This month our team began in earnest creating Standard Operating Procedures (SOP's) for the different processes in each production team. 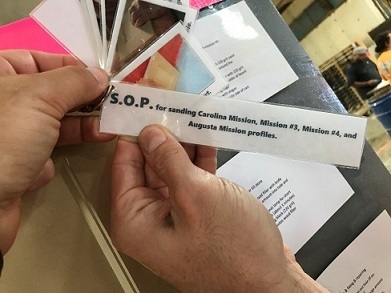 The Handwork/Quality Control Team came up with an incredibly creative way implementing their SOP's by including photos and then placing the laminated materials on rings. 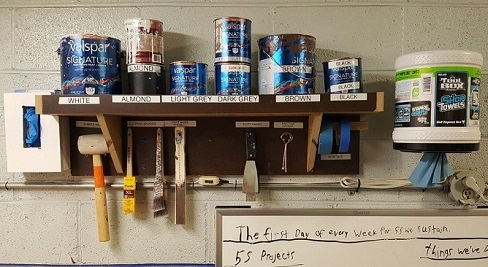 These were hung beside each corresponding door sample giving anyone needing to know how to sand a particular panel profile the ability to quickly see the "best practice" to get the job accomplished. Wastes reduced: Defective Output, Waiting, Over-Processing, Motion, Unused Employee Genius. Lean works! Written by Julie Arnold on September 5, 2017. Little by little, these Waste reductions each day add up to real increases in productivity: more time available to do what our customers are paying us to do, with less frustration, leads to a greater genuine sense of accomplishment for everyone. That’s what continuous Improvement is all about! As we continue with learning to think “Lean”, we seek to strengthen the habit by setting aside time every day to share one improvement we have made. Every day we meet together to hear a team member give a presentation about an improvement made in his or her department. At the end of the presentation we take questions/comments and go over which of the 8 wastes were reduced. Then the team members spend time looking for more ways to implement Lean Improvements in their own departments. Here are some of the presentations that we’ve had over the month of June. 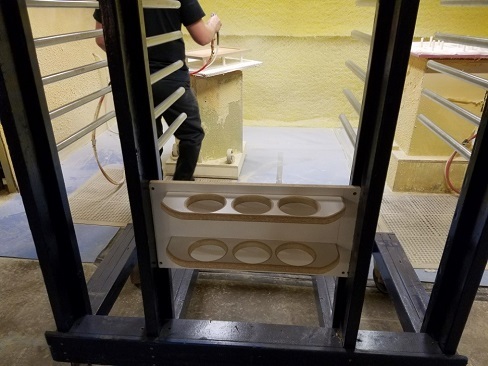 Here, we have Jamille in the Spray Booth showing us how his department fixed an issue with handling mouldings through the booth. They designed a special board to hold multiple mouldings at once and hold them still. 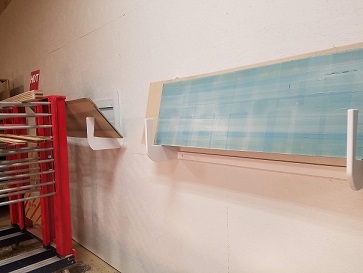 This allows them to spray glue evenly and then quickly transfer mouldings from the rack to the spray booth and then back again without the strips falling or moving around in the process. This improvement reduced the Waste of Overprocessing in the booth, and the Waste of Waiting at the press (the next process). 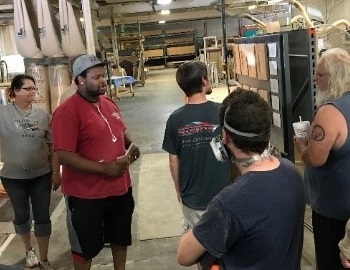 Here, Toney is sharing how the Handwork Department simplified their end-of-day inventory counting by creating a dry-erase board with all the moulding names and numbers. Instead of recounting all the inventory every night, they track the usage throughout the day as they draw from the inventory. 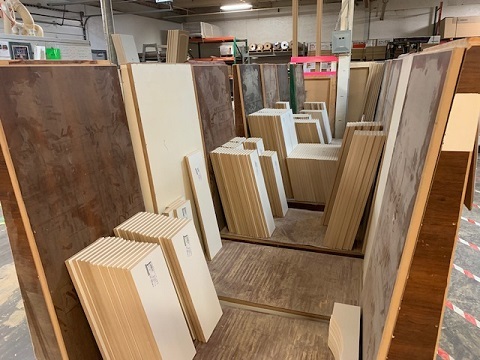 At the end of the day they send a picture of the inventory to David, in purchasing, to notify him which mouldings need re-stocking. This simple improvement reduced “non-value-added” counting time (overprocessing), freeing up team members to do more “value-added” work. Three of the “5-S’s” are Sort, Set-in-Order, and Standardarize. 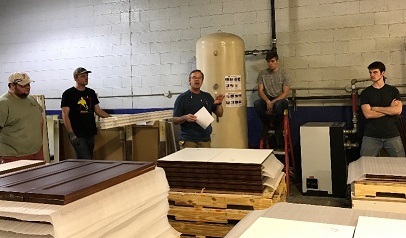 Here, Mark Arnold is showing us how the Shipping Department used “5-S time” to design wooden boxes specially made to hold the various tools they need to wrap each order. 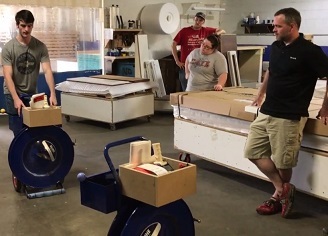 They attached these boxes to the Metal Strap Machine that they use to palletize each job, saving them from having to walk back and forth to the counter looking for the tools they need to complete the job. This well thought-out improvement reduces Motion, Waiting, and Overprocessing! Since the Shippers have made their job Easier, they have more time to lay out skids Better, and are still able to do it Faster than before. With less rushing to get skids ready, they have likely reduced Defects due to handling errors, as well! Written by Julie Arnold on August 15, 2017. May brought us many new Lean Improvements! We toured the plant during one of our company-wide meetings so that employees could “show off” the ways that they have 5-S’d their departments. 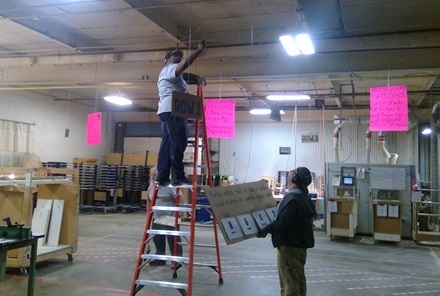 Here, Dale, Ethan, and Mark are showing us how they improved the Shipping Department. First, they mounted a vacuum on the wall next to the miter saw to catch debris while cutting and it really keeps the area clean; It actually eliminates the need to clean the area at the end of the day! They also used clamps to keep the cords from various tools off the ground and neatly organized without having to rewrap each cord every time. Finally, as you can see in the picture, they moved the cardboard cap inventory closer to their location to reduce the number of steps packing between them. This cardboard also used to be up high, and is now ground level making it easier to access. 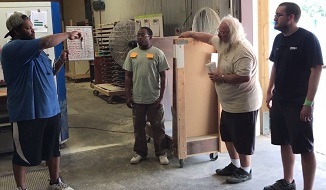 In this next picture Tony is showing us the new sample board his department created that displays our many different door profiles. This makes for an easy visual for new employees to see between similar profiles. It also serves as a guide to how those different profiles should be sanded, and how the door should look when it is finished. 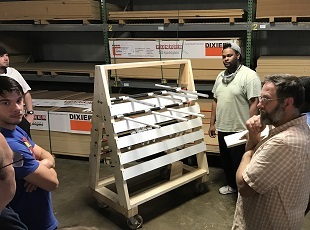 Kyle is showing us a new rack that the Press department created to organize the different sizes of filler blocks (third picture). This helps reduce motion, transportation, and waiting; but also eliminates confusion when one person may call out for a certain size or color. 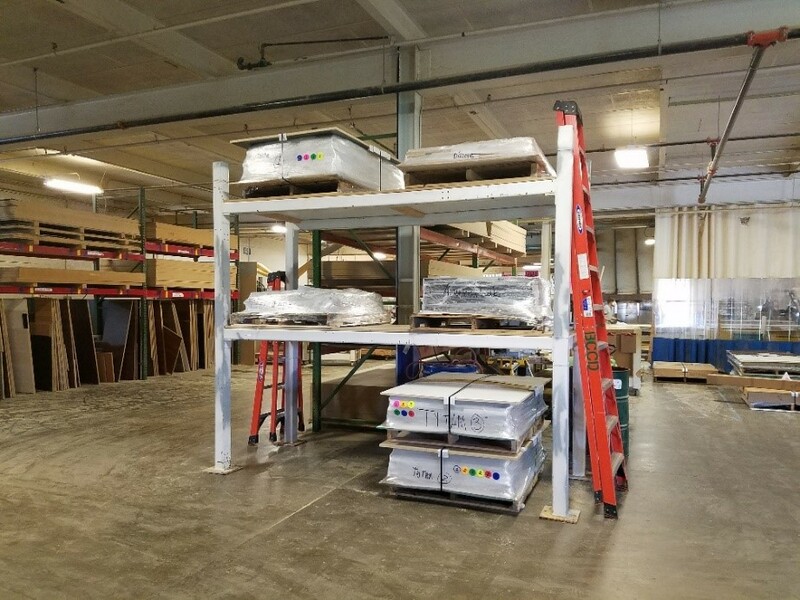 They reduced the number of different block sizes, color-coded the remaining blocks by size, and put the smaller storage rack right behind the loading table. It also speeds communication by letting operators identify blocks by color, not by size. 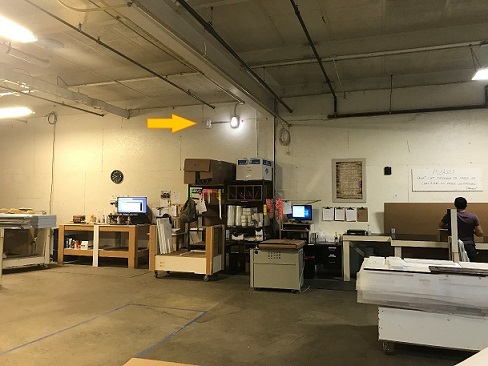 As Geoff is showing us in this last picture, we also began posting Standard Operating Procedures (SOPs) throughout the shop as part of the Lean Improvement process. 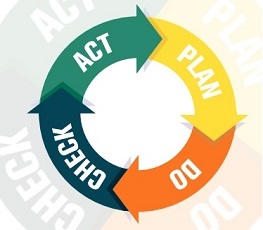 We asked team members from each department to work together to come up with a list of steps that describe best practices for the processes they do daily. The goal is to have everyone follow the same procedures to eliminate confusion, improve efficiency, and reduce defects. Written by Julie Arnold on June 20, 2017. As we mentioned in our March update, we came up with a list of ways to improve the Press throughput during our first Kaizen event. One of the improvements that we implemented right away was a “scoreboard” for the Press. We installed a large monitor over the Press to display key statistics in “real time”. 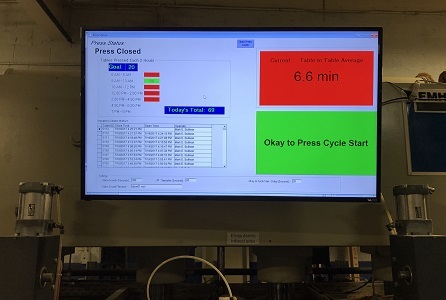 It displays current cycle time, average cycle time, total cycles for each production period, and a warning screen when it is too early to start the next cycle. Seeing these numbers has helped us visualize what we are capable of producing and where we are ahead or behind of our takt times. The month of March brought many new challenges along our Lean Journey. These challenges provided us with an opportunity to consider looking deeper into our production process to find possible areas for growth and development. After careful consideration, we decided to focus our efforts on helping the Press Department gain throughput capacity. The task of evaluating such a complex process would require much time and energy "outside of" the production process. 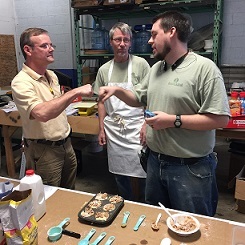 We chose a small group of team members and hired Lynn Thompson from Quantium Lean to coach us through our first Kaizen event. There were two main purposes for our Kaizen, or "good change" event. The first was to learn how to successfully conduct a change event of this scope. The second, but just as important, purpose was to improve the throughput in our Press Department. We began by mapping out every action and decision currently involved in running a single press cycle, and then to obtain measurable data that we could use to help us track and reduce the overall press cycle time. Reducing the cycle time would give us a great opportunity to produce more cycles. Through visualizing the entire cycle using Value Stream Mapping, many new opportunities for increased throughput became very evident. As we saw the many different wastes in our process, our team came up with lots of suggestions to eliminate them. Some ideas were incredibly crazy that we could only dream about doing, while others we were able to prioritize and actually begin making the improvement idea a reality right away. One of these ideas was to improve our spray racks. After getting input from other team members who use the racks, we quickly designed and built a new prototype rack to test. As we used the new rack in production, we found more ways to improve the design! The end result is helping to achieve an improved Press throughput! Because of the dedicated, engaged team members and their amazing involvement, our first Kaizen event was a success! We came away with a way to measure and track our results, have made several improvements that have immediately improved our Press throughput, and have a long list of improvements to continue making in the days and weeks ahead. As we went through this Kaizen Event, most importantly we learned a valuable process to use as we work together to find and implement improvements, all this while even having FUN as a TEAM! Written by Brannon Brock on April 28, 2017. This month the entire BCC Doors team completed an intensive 3-day Lean Learning Event at our location. 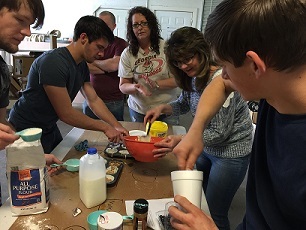 Lynn Thompson from Quantium Lean was our instructor and made the class both informative and fun. Day One - We covered the basic principles of Lean and why they are important and helpful to us not only at our workplace but also at our homes. Day Two - We learned about the 8 Wastes: Transporation, Inventory, Motion, Waiting, Overprocessing, Overproduction, Defective Output, and Unused Employee Genius. These wastes are all enemies of adding value to the products and services we provide. 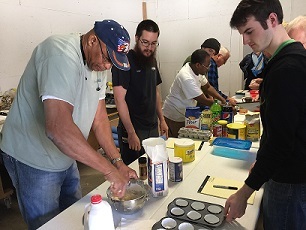 Day Three - We not only studied the Methodology of 5S in the classroom setting, but we actually put it into practice with an incredibly "eye-opening" Muffin Making Excercise. The five S's are: Sort, Set in Order, Shine, Standarize, and Sustain. We had some intense competition happening between 4 different teams during the Muffin Making Excercise. Through the four different rounds of competition, we learned how implementing 5S within a project made the process not just easier, but made it better and faster, too! 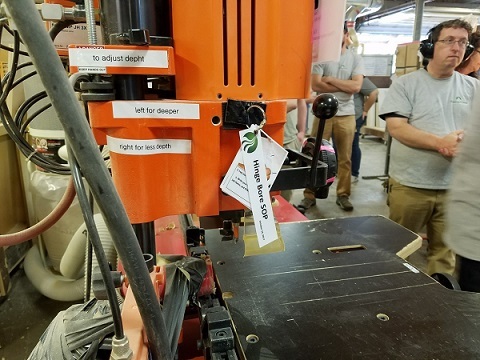 The day after we completed our classroom training, we began implementing 5S in a few areas in our plant and discovered that LEAN really does work. In the months ahead, we look forward to showing before and after pictures of some of the improvements we are making. The most exciting discovery we made over the 3-day Lean Learning Event was that we can have FUN doing LEAN together! Written by Mark Sullivan on March 31, 2017. Some orders that come through the shop require hinge boring. As we bored these doors, we noticed an alarming amount of shavings and debris collecting on the floor and around the boring machine. This made the the process of boring for hinges quite a challenge, and the necessary clean-up time that followed was a "waste" (see left picture). We analyzed the situation and decided to place a suction hose closer to the boring bit at the base of the machine. 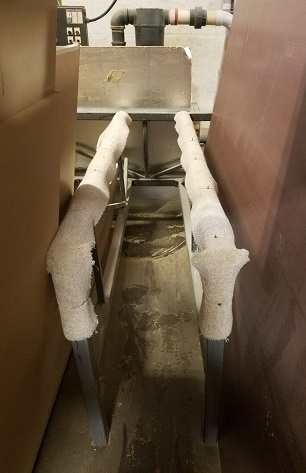 Then we moved our dust collector closer to the pickup point, giving us better suction and saving steps to turn it on and off. The results were amazing! We virtually eliminated the debris problem and avoided having to take extra time to clean (see right picture). By making it easier, we made it better and faster, too! Written by Brannon Brock on February 13, 2017. Paul Akers - What is Lean?